Though GameSpot managed to spill the beans mere hours before Square Enix’s Uncovered: Final Fantasy XV event in Los Angeles last night, spoiling the upcoming title’s release date in a since-removed YouTube video, they certainly didn’t manage to ruin all the surprises. Square Enix’s social media accounts had promised that fans of the long-running Final Fantasy saga should tune in regardless, promising they’d be missing out if they didn’t watch. And, as it turns out, they were absolutely spot on, as Uncovered featured a bevy of reveals, announcements and surprises, the first of which was Hironobu Sakaguchi, the father of Final Fantasy, opening the show. Taking the stage to rapturous applause, Sakaguchi-san talked about how he views the series as his child, and much like a child, a parent often wonders whether they are on the right path or not – a not so veiled reference to the franchise’s recent struggles that sent some ripples of laughter through the 6,000-strong audience, and set a playful, self-assured tone for the rest of the night. Though he hasn’t been involved with Final Fantasy for quite some time now, leaving Square Enix over a decade ago, he spoke about how he had a chance to sit down with Final Fantasy XV director Hajime Tabata, who told him that he planned to take the series back to its ‘challenger’ roots. This reassured Sakaguchi, who had always thought of Final Fantasy as something that always sought out new challenges, and it certainly looks like that’s what the team are hoping to do with Final Fantasy XV. The main takeaway from Uncovered is that Square Enix seem to be incredibly bullish about Final Fantasy XV‘s chances at recapturing the public’s imagination. They’re going all out with this property, treating fans to a lavish event streamed around the world, with Final Fantasy royalty in the house – as well as Sakaguchi-san, long-standing series artist Yoshitaka Amano, FFXV composer Yoko Shimomura and director Hajime Tabata were all in attendance. Last night’s event wasn’t just to generate hype for the new game, which we now know will be launching worldwide on September 30th (yes, this year); it was also to announce that Final Fantasy XV will be accompanied by its very own compilation of expanded material. Years after Final Fantasy VII’s release, with its legacy already assured, Square Enix began the Compilation of Final Fantasy VII. With Final Fantasy XV, they’re establishing it as its very own metaseries right now. In an astonishing display of confidence, last night Square Enix, via presenters Greg Miller and Tim Gettys of Kinda Funny Games, announced that Final Fantasy XV will be getting a five-part anime prequel series, a feature-length CG movie, and a mobile app minigame. They’re going all-in with this, turning Final Fantasy XV into a complete cross-media sub-franchise of its own, so let’s talk about each of those in a bit more detail. 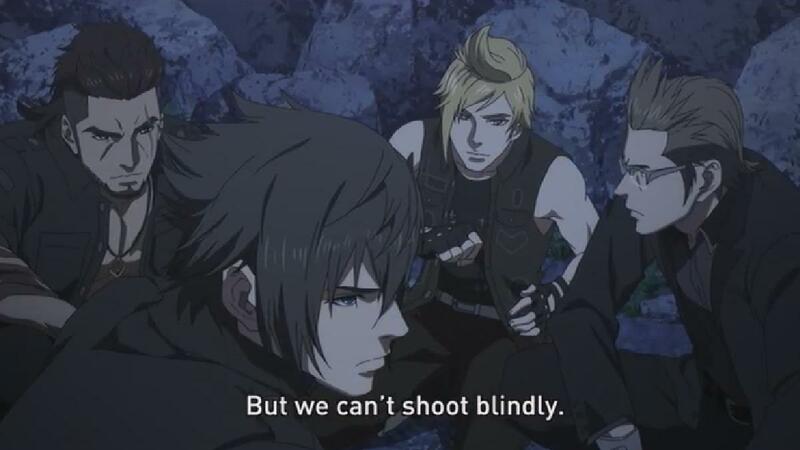 Brotherhood, the anime prequel, stars the game’s four main characters – Noctis, Ignis, Gladio and Prompto – and serves as a direct prequel to the game, promising to elaborate on the history and bonds between our heroes. Made by A-1 Pictures, the animation house behind the likes of Sword Art Online, the five episodes will be free to watch on Square Enix’s YouTube page, and the first one is already available to watch now. I’ll be writing about that in more depth in a separate piece. Kingsglaive is the name of the CG movie, a feature-length film in the vein of 2005’s Final Fantasy VII sequel Advent Children, and it focuses on the characters of Noctis’ father King Regis of Lucis, Noctis’ betrothed, Lunafreya Nox Fleuret, and the soldier Nyx, a member of the titular Kingsglaive, an elite unit commanded by King Regis as they try to push back Niflheim’s imperial army. In another show of confidence, the film will feature an all-star cast, with Sean Bean, Lena Headey and Aaron Paul starring as Regis, Luna and Nyx respectively, though it’s not yet clear whether these same actors will reprise their roles in the game itself (or whether Nyx will even appear in-game). It certainly doesn’t seem to be the case, going by the game’s latest trailer, in which Regis sports an American accent, but time will tell. Kingsglaive will be available to stream and download worldwide sometime this year, and you can see the trailer below. And then there’s Justice Monsters Five, a minigame that appears and is playable within Final Fantasy XV. Existing within the game’s fiction – we see our heroes excitedly come across a table in a diner – Justice Monsters Five appears to be some kind of pinball/battling hybrid featuring iconic Final Fantasy monsters. Leading up to its unveiling, names like Tetra Master, Triple Triad, Blitzball and Chocobo Racing were bandied about, so we can assume that Justice Monsters Five will be the main minigame in Final Fantasy XV. But it won’t just exist inside the game of course, as it will be coming to iOS, Android and Windows 10 as a standalone app, so you can get your Justice Monsters Five fix on the go. While there was quite a focus on the supplemental, expanded universe content during the Uncovered event, that’s not to say we didn’t get a good look at the game itself. Viewers were treated to a few short gameplay clips featuring things such as chocobo riding (chocobos can jump, glide, and even drift around corners), and driving in the party’s car, the Regalia. Of course, an open world game with driving wouldn’t be complete without radio stations, and Final Fantasy XV doesn’t disappoint here, offering a selection of classic Final Fantasy songs from across the franchise’s entire history to cruise along to – we heard short snippets of the overworld theme from the first Final Fantasy game, as well as Sunleth Waterscape from XIII. As a huge fan of Final Fantasy music this is something that will make me very happy indeed, and I can imagine driving around the world for hours just listening and humming along to some classic FF tunes. While driving around, we also see a car stopped at the side of the road, its occupants trying to flag down help, and it’s suggested that this is an example of some of the side content we’ll be seeing in the full game. 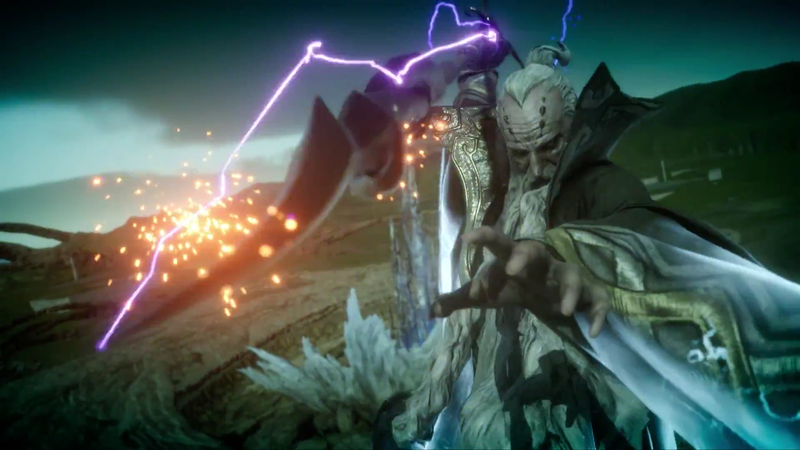 Following that was a short clip of the party in battle, mostly showing off stuff that you’ll be familiar with if you played Episode Duscae last spring, with the addition of a short look at magic as we see Noctis manage to scare off an enormous Behemoth by casting Blizzara. Then we’re treated to a brief glimpse of an absolutely titanic Titan, and at this point it’s worth remembering that the summons in this game are going to be insane. We also saw a clip showcasing some of the beautiful, sprawling environments that we’ll be visiting throughout the world of Final Fantasy XV, including our first in-game look at the gorgeous, Venice-inspired city of Altissia. Final Fantasy XV has long been billed as “a Fantasy based on Reality’, but fans of the fantastical need not worry that the game will appear mundane; there seems to be plenty of fantastical elements and environments in there to justify the name, and you can see the clip shown last night below, courtesy of Youtuber YongYea. Honestly, it’s worth watching for the music alone, which is stunningly beautiful. Before our final surprise of the night, there was time for a couple more announcements. First heard in the opening trailer, the theme song for Final Fantasy XV is a lush, orchestral reimagining of Ben E. King’s Stand by Me, performed by Florence and the Machine. I must admit that I thought it sounded incredibly out of place when it suddenly began, halfway through that trailer, even if does seem like an obvious song choice for a story about four friends heading out on an uncertain journey. But I think it’s going to grow on me. Florence Welch’s powerful vocal performance certainly sells the emotion of the piece, and as the trailer goes on it seems to fit more and more. If Square Enix must insist on this kind of thing, at least it’s a much better choice than Leona Lewis’ My Hands was for Final Fantasy XIII. Perhaps most exciting of all, however, was the announcement of a new demo. This one isn’t tied to a purchase, unlike the Episode Duscae demo that accompanied Final Fantasy Type-0 HD last year, so it’s available for everyone to try on both PS4 and Xbox One. Titled the ‘Platinum Demo’, it begins with a strange premise; you control kid Noctis as he journeys through a dream, guided by Carbuncle as he makes his way to the royal citadel, armed only with a toy sword and a squeaky hammer. It sounds odd, but the good thing is you don’t have to wait to find out just how weird it is, as the demo is live on both storefronts right now. 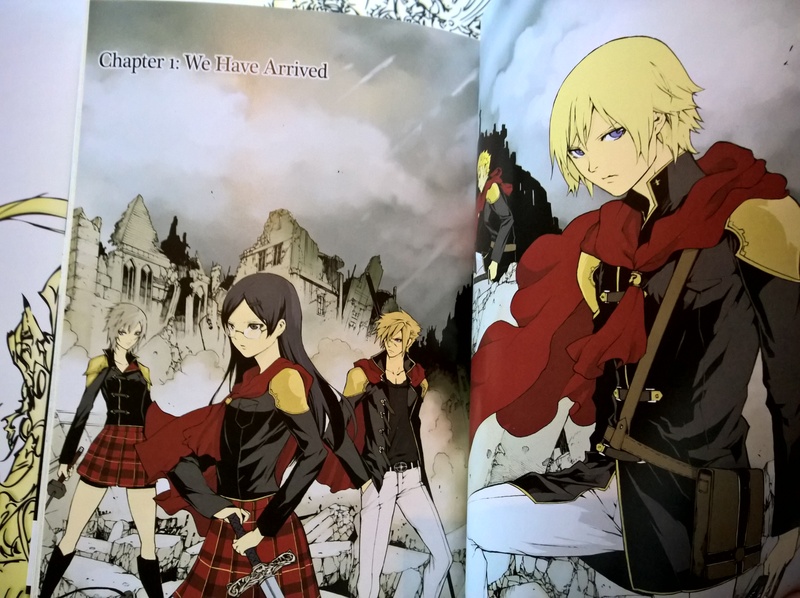 I haven’t yet had a chance to play it myself, so, like with the Brotherhood anime, I’ll be writing up some impressions, complete with video, a little later, much like I did last year with Episode Duscae. And so we were coming to the end of the Uncovered event, with Director Hajime Tabata taking to the stage to announce the release date that we all already knew. This didn’t mean the stream ended without a surprise, however; Tabata had recently teased that the team had determined how to include airship travel in the game, a core FF motif that has been essentially missing from the last few main series titles that fans really want back. At the very end of an epic, extended trailer, we see the party’s flash car sprout wings and take to the skies. If I’m being honest, I found it to be a little goofy, as the car begins to transform and a pair of wings fold out before it rather quickly takes off. Hopefully it’s just one method of transport – the same trailer shows the boys speeding across the water in a yacht, for instance. 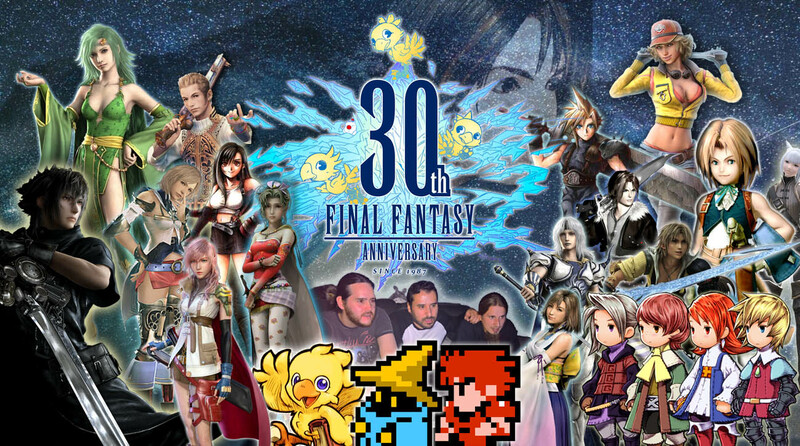 Still, the thought of driving, boating and flying around this massive world is tantalising, and with all of last night’s announcements still ringing in the ears, today is a good day to be a Final Fantasy fan. Square Enix seem hugely confident about the prospects of this long-in-development epic and its chances at winning back the limelight and returning to the enormous, world-conquering franchise it used to be. And I for one cannot wait to dive right in and experience it. I’ll have to wait until September of course, but what’s another six months when you’ve been dreaming of it for ten years? See the epic extended trailer for Final Fantasy XV, complete with flying transformer car, below. I’m back with another unboxing video! It’s been a while since my first, and this one is a fair bit longer – in fact, I had to chop it into two parts. This was actually filmed on Tuesday, and it’s taken me until today to get it edited and uploaded to YouTube – I’m still learning! 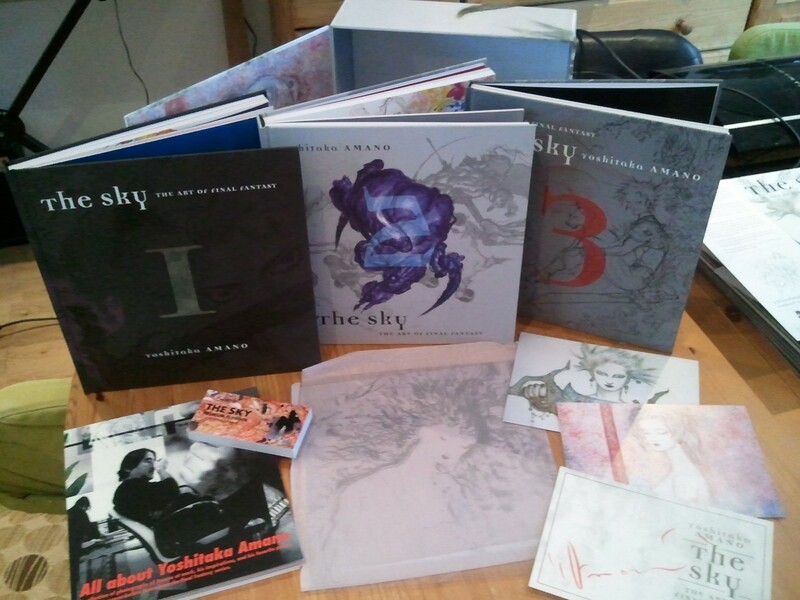 This Yoshitaka Amano boxset was originally released in Japan in 2001, and as such covers art work created by the man himself for the first ten Final Fantasy games. 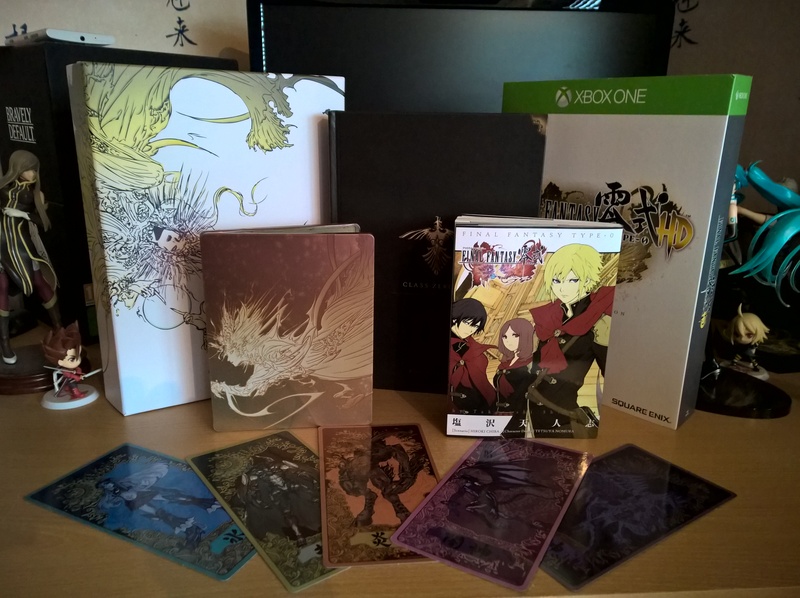 Broken into three large hardbound books, the first contains art from Final Fantasies I-III, the second (and largest) book covers IV-VI, and the final book covers off VII-X. 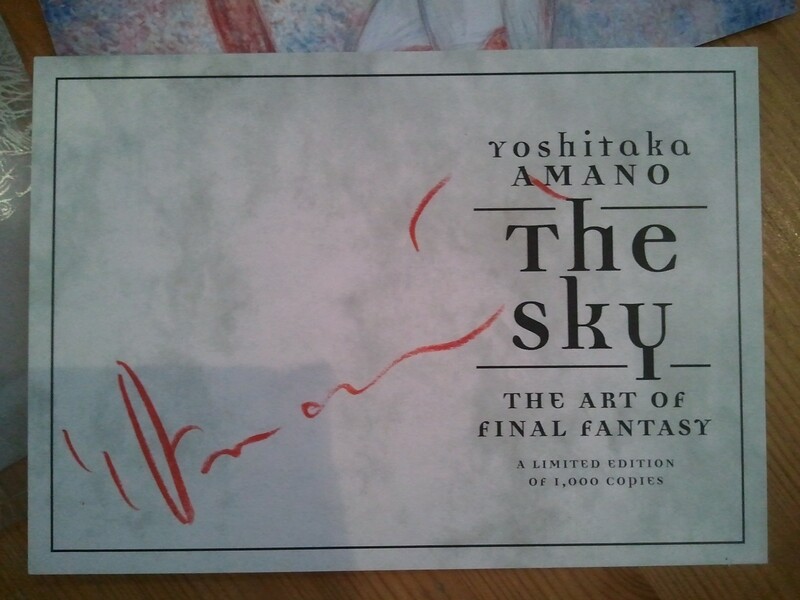 We also get a small, double-sided flipbook, a couple of postcards, and a paperback tome entitled ‘All About Yoshitaka Amano’, which contains interviews with Amano and insights into his inspiration and creative process. See the two videos below, where I am ably assisted by my good chum Dan ‘The Marathon Man’ Bushell, to get a good look at the set, and let me know what you think in the comments below.